The Sony Xperia neo L has quad-band 2G and dual-band 3G. Mobile data speeds are boosted by 7.2Mbps HSDPA and 5.76Mbps HSUPA. Local connectivity is covered by Wi-Fi b/g/n with DLNA, so you can easily share content from your phone on a DLNA TV or music player. There's also Bluetooth 2.1 with A2DP on hand. The Media Remote app is available for free download at the Play Store so other Android smartphones can use it too. The neo L also comes with Sony's LiveWare manager, which can be set to launch an app each time you connect an accessory, e.g. a headset or a charger. One of the biggest advantages that the Sony Xperia neo L gets from running Android ICS out of the box is the updated web browser. This browser has a streamlined interface, incognito browsing and other cool features. The browser chrome is quite minimalistic; all you get is the URL bar with a tabs shortcut. Hitting the Menu key you get more options - Refresh, Forward, Save to bookmarks, Share page, Find on page, full settings and a couple of more - Request desktop site (no more hunting for that "Desktop" option buried at the bottom of the site) and Save for offline reading. One of the important features in the web browser is the full Flash 11 support. It did not come pre-installed on our phone, but ran without any problems when we installed in from the Play Store. YouTube videos played smoothly all the way up to 720p (1080p crashed the plugin, not that you'd want to watch 1080p video on this phone). Flash games played trouble free too. The Sony Xperia neo L lasts a bit over 4 hours when browsing the web over Wi-Fi. That's about as much as the Xperia neo V did and a bit better than Xperia U. 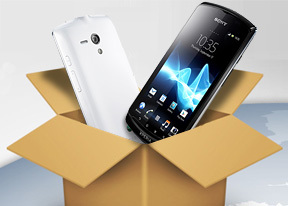 The Sony Ericsson Xperia neo L comes with a solid set of organizing options, including a document viewer. The app in question is OfficeSuite and it has support for viewing document files (Word, Excel, PowerPoint and PDF, including the Office 2007 versions). The Pro version (a $15/€13 update) can also edit documents.